The first GET REAL Involved! 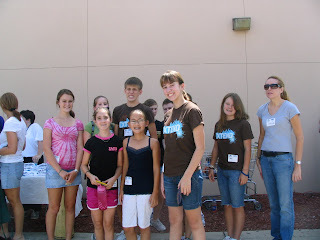 community service project of the 08-09 school year was to Metropolitan Ministries Backpacks of Hope. What a great day. 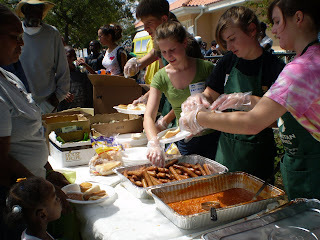 What a difference Metropolitan Ministries makes in the community. I think they had like 4,000 families come through to pick up a fully loaded backpack to get their kids ready for school. There were about 14 of us, not bad for the first project of the year! And we served food to the guests, and managed the haircutting area. That was a really neat addition this year to the Backpacks of Hope: they offered families haircuts from a local hair cutting academy. It was just like a barber shop, down to the little boys crying over their first hair cut! About halfway through our shift the skys opened up and the rain dumped down on the crew that was serving on the food line! They were drenched! It was hilarious. They had to scurry inside and try and get dry with paper towels! I mean they looked like they had been dunked into a pool they were so wet. What a downpour. 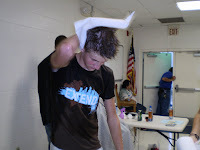 For the rest of our shitf they tried to dry off and they helped us manage the line for hair cuts. The barbers completed about 100 haircuts — they were amazing. And the families were so excited to have the new service provided this year. Great idea! All in all it was a really good day. 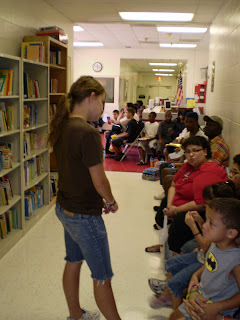 We got to help people, run screaming in the rain, meet some new folks, and hang out with friends. It was Emily E.’s last GET REAL day with us as a student. She’s off to Samford and we’re going to miss her!